The IPCC’s reports are comprehensive and balanced assessments of the state of knowledge on topics related to climate change. There are different types of reports but all go through a rigorous process of scoping, drafting and review to ensure the highest quality. The IPCC prepares comprehensive Assessment Reports about the state of scientific, technical and socio-economic knowledge on climate change. Assessment Reports consist of contributions from each Working Group and a Synthesis Report integrating these contributions and any Special Reports prepared in that assessment cycle. The IPCC also produces Special Reports on specific issues agreed by its member governments and Methodology Reports that provide practical guidelines for the preparation of greenhouse gas inventories. Each IPCC report starts with a scoping meeting to develop a draft outline. Experts nominated by member governments, Observer Organizations and the Bureau and selected by the relevant Bureau prepare a draft outline of the report for the Panel. Based on the report of the scoping meeting, the Panel decides whether work should continue on preparing the report and agrees on its scope, outline and work plan including schedule and budget. Member governments, Observer Organizations and the Bureau (Co-Chairs and Vice-Chairs) of the Working Group or Task Force producing the report then draw up lists of experts, from which the relevant Bureau or Bureaux select the authors of the report. The Bureau may consider other experts known through their publications and work. Scientists who are nominated but not selected as authors are invited to register as expert reviewers for the report. The selection of authors is a careful process that aims to reflect the range of scientific, technical and socio-economic expertise and to strike a good balance in terms of gender, geographical representation, and representation of experts from developing countries, developed countries and those with economies in transition. It is also important to have a mixture of authors with and without previous experience in the IPCC. The IPCC prepares comprehensive Assessment Reports about the state of scientific, technical and socio-economic knowledge on climate change, its impacts and future risks, and options for reducing the rate at which climate change is taking place. The IPCC also produces Special Reports on specific topics agreed by its member governments, as well as Methodology Reports that provide practical guidelines for the preparation of greenhouse gas inventories. The Synthesis Report integrates the Assessment Report and any Special Reports prepared during an assessment cycle. A report consists of a number of chapters. It may also include a Technical Summary, prepared by the authors. Assessment Reports, Special Reports and the Synthesis Report include a Summary for Policymakers that is prepared by the authors and approved line by line by a Plenary Session of the IPCC with the delegates in dialogue with the authors. Since the Fifth Assessment Report, the Summary for Policymakers has generally included headline statements, providing a top-level summary and narrative of the key findings. Methodology Reports include an Overview Chapter corresponding to the Summary for Policymakers. Reports may include Supplementary Material such as Frequently Asked Questions. Information about published and upcoming IPCC reports can be found on the Reports page. Once the author teams are selected, they begin work on a First Order Draft of the report based on an assessment of all relevant scientific, technical and social-economic information. Although priority is given to peer-reviewed literature, the IPCC recognizes that non-peer reviewed literature, such as reports from governments and industry, can be crucial for expanding the breadth and depth of the assessment. Use of this literature brings with it an extra responsibility for the author teams to ensure the quality and validity of cited sources. Review is an essential part of the IPCC process and ensures that the assessment of literature is transparent, objective and complete. In the first stage of review, experts from around the world are invited to comment on the accuracy and completeness of the scientific, technical and socio-economic content and the overall balance of the drafts. These expert reviewers self-nominate and are accepted by the IPCC on the basis of relevant expertise. Each and every review comment is considered by the authors in the preparation of a Second Order Draft of the report. At the same time, the authors also prepare a first draft of the Summary for Policymakers (SPM). This is a distillation of the main policy-relevant findings from the underlying report. 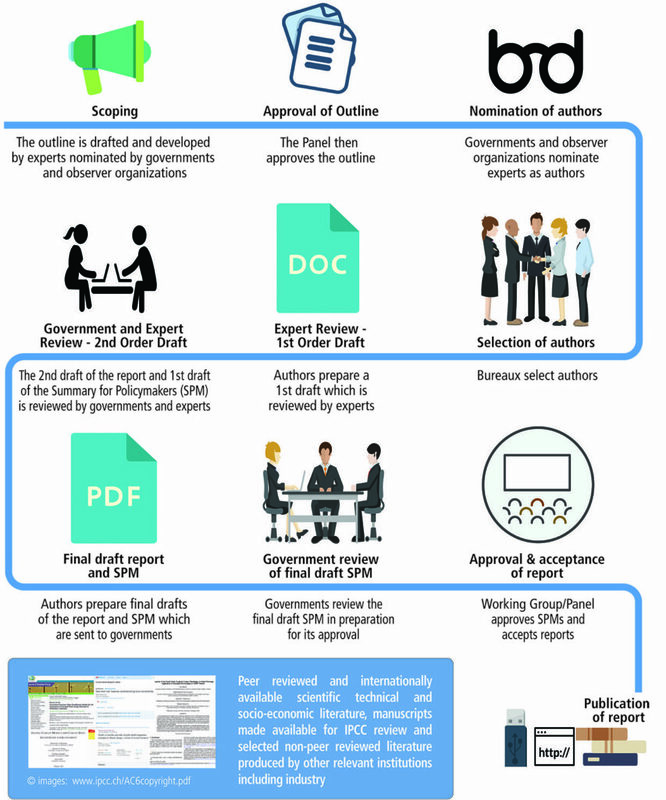 The Second Order Draft of the report and the first draft of the SPM are then opened up to review by experts and governments, simultaneously. Each chapter of an IPCC report has two or more Review Editors assigned to it, who are selected by the Bureau on the basis of their expertise and whose job it is to make sure that all comments received during the reviews are taken into account by the author teams. All review comments, and the responses by authors, are published on completion of a report. In the assessment, authors express the confidence with which a statement is made, reflecting agreement in the scientific literature and the evidence available. They use calibrated language to communicate certainty in key findings. “Approval” means that the material has been subjected to detailed line-by-line discussion and agreement. This is the procedure used for the Summary for Policymakers. “Adoption” describes a section-by-section endorsement. This is used for the Synthesis Report and overview chapters of Methodology Reports. “Acceptance” signifies that the material has not been subject to line-by-line or section-by-section agreement but nevertheless presents a comprehensive, objective and balanced assessment of the subject matter. Special rules apply to the Synthesis Report, which integrates the findings of the Assessment Report and any Special Reports prepared during an assessment cycle. These are written in a non-technical style suitable for policymakers and address a broad range of policy-relevant but policy-neutral questions approved by the Panel. The Synthesis Report consists of two sections: a Summary for Policymakers and a longer report. The IPCC Chair leads a writing team whose composition is agreed by the Bureau after nominations by the IPCC Chair in consultation with the Working Group Co-Chairs. It typically draws on members of the Bureau, authors of the Assessment Report, and experts from the Technical Support Unit and Secretariat for its Core Writing Team. The writing team prepares a draft of both the longer report and Summary for Policymakers, which undergo simultaneous review by governments and experts. The report is then revised and submitted to the Panel for consideration. The Panel approves the Summary for Policymakers line by line, and the adopts the longer report section by section – roughly one page at a time. For more on the authors and the people behind IPCC reports, see Structure. For in-depth detail on the principles governing IPCC report writing or the review process, see Procedures.